I like to take this time to introduce myself in the only way I know how. That is by sharing with you my feelings and what I see around me each day of my life. I have written a few things for friends around the world and made up home pages for them so they could see what my small part of the world is like. I am a poor writer at best so I ask that the spirit of the Lord be with you as you read what I have written and not judge me on my poor writing skills. The title "Sir" was given to me as a gift by the research teams I work with in wildlife research projects with the Grizzly, Bald Eagle and Caribou. 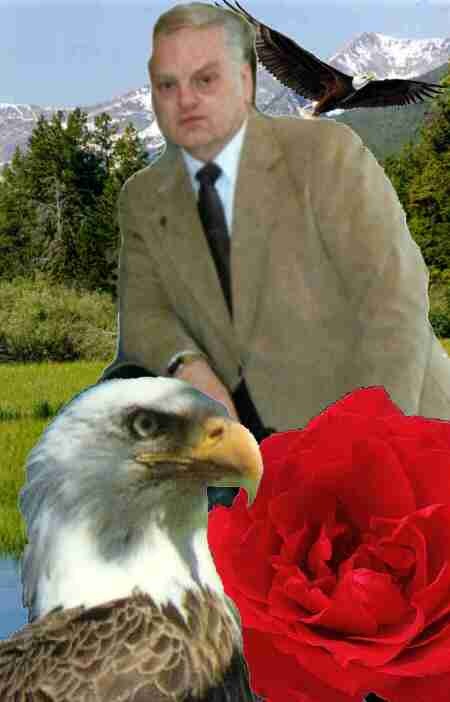 Because I have the same spirit as the great Bald Eagle I find that I write with the spirit of the eagle. I will tell you why each was written as we go along. Click on the small pictures will enlarge them to full size. Click on the blue Hyper Link to get the rest of the story. The Loon is something I wrote after talking to many on the Internet as we all shared a part of our lives with each other. So many have been hurt both mentally and physically and often times both. I thank each for sharing and giving me a special gift. The Loon is a bird that lives in the high mountain lakes and it sounds is very beautiful. A Walk With A Friend was written for a special friend of mine locked away in the big city and having a lot of problems at home and needed to get away for a moment of peace and quite. The Wounded Eagle was written as a result of a close and special friend of mine getting involved with someone that wanted to marry him. He met her on the Internet. He told her that he wanted to think about it and would take a week off and go into the wilderness area to pray about it. He never received an answered while in the mountains but the day he got home he checked into the Internet and found she had moved in with another man. He was hurt by this, but understood how blessed he was that he had taken the time to pray about it. It is sad to see that truth, trust, honor and love are only used when it fills a persons need for such things as greed/lust/deception/ego etc. Many from around the world wanted to see what Western Montana was like and so with camera in hand I put up first home page for them. So lets go for A Walk Down the Bitterroot River in the Fall. Includes a couple of self-photos of myself. I grew up in the Pacific Northwest and spent many days out sailing the mighty Columbia River or the Inland Passage in Canada. So with this home page I share a little of the wonders of my youth as well as western Montana. So spend some time with me as we see the Wonders of the Northwest. My Views of a Woman and the relationship between a man and a woman. Just a very short view, as well as another look at me. Once again a special friend wanted to spend some time with me. She had just gotten out of the hospital after a severe beating by her ex husband. She had gone through several surgeries in order to put her face back together. So this was written to take her away for just a few minutes through cyberspace. So we spend a day at a Mountain Beach. Even though the writing I have included in here may seem sad, I'm not a sad person. Just the opposite. I can just feel there pain and understand it. But the saddest thing I find is that so many are looking for happiness and peace and can't seem to find it. They look for it in others to make them happy or in money or many of the worldly things that people go after. Many are lonely and have not learned to live with themselves because they have low self-esteem. I went through an living hell for a few years and yet was still happy. Both peace and happiness comes form within a person. It is being true to yourself and knowing that you have done your best and what you believe is right. It is reaching around and patting yourself on the back what you do good and reminding yourself of the things you can improve on. Then reaching out beyond yourself to help others. Then and only then will you be happy even if you are living in hell, in a poor marriage, living alone. Life is exciting and so much to see and do and learn. It makes no difference if you are in the big city or remote area. Just open your heart and eyes and listen and you will see the wonders at your feet.